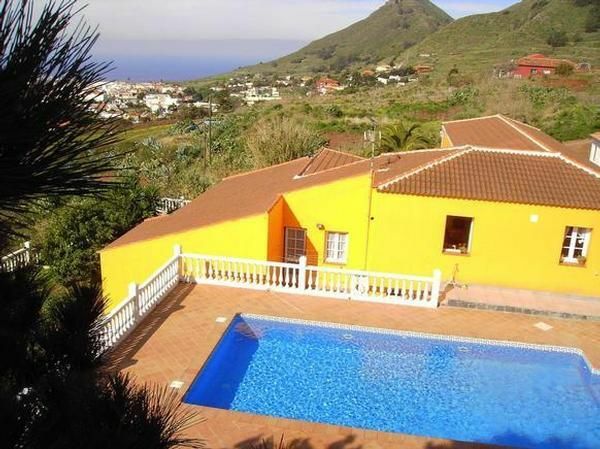 Wide 2 floors country side home for 8 people in Tegueste, Tenerife. Guests have a spacefull accomodation with 4 bedrooms, 2 with double bed and 2 with 2 beds in each located in the upper floor. There are self catering facilities in a lovely well equipped kitchen with combi fridge and freezer, oven, microwave, toaster, coofee maker, dishwasher, cooking and eating untensils. The kitchen has a dining table but there's a dining room as well. Downstairs there's a large sitting room area with comfortable sofas. The outdoor area has a 9m long outdoor pool , a BBq area and also a porch with outdoor furniture. The weather is usually very nice in this location so guest really enjoy the outdoor.